Over the past couple of years I have found myself writing a number of file decoders for use in my own personal codebase (PNG, TTF, BMP, WAV, OGG, and most recently FLAC). Decoding compressed file formats in particular will involve reading an arbitrary number of bits, which necessitates the need for a bit buffer. Over the course of implementing the aforementioned decoders, I tended to just write a new bit buffer implementation each time or copy a previous one over, but when it came time to write a FLAC decoder I wanted to clean these up and write one reusable bit buffer implementation. However, I was curious to investigate some meta programming options. I admit, I like meta programming, but I am not really a big fan of C++ templates. I find anything but a restrained use of them leads to unnecessarily obtuse code that is hard to read, hard to follow, and a headache to debug. Not to mention having to keep in mind subtle side effects such as code bloat and portability issues. Being a fan of meta programming though, I can tolerate some amount of template usage. Test case A. Reading single bytes. It should come as no surprise that the branching method clearly loses out to the other three, which are quite close together. Test case B. Reading uint16_t’s. Here we see a similar pattern with the three non-branching implementations being very close in execution time. Test case C. Reading an arbitrary mixture of bits (4, 1, 2, 1). While the three non-branching methods remain close in execution time in this last test case, the template specialization method edges out the other two here after the initial spike. I’ve run these test cases several other times and observed similar findings, so I’m rather pleased to see a fairly simple, straightforward use of template specialization is a worthy approach for compile-time method overloading when performance is of primary concern. For the sake of completeness, the compiler used was Clang with Apple’s LLVM 9.0 backend (Xcode 9.4.1) with -Os optimization. This entry was posted in Programming and tagged big-endian, bit buffer, C/C++, little-endian, metaprogramming, programming, templates on September 8, 2018 by Chris. A little while ago I wrote a post about improving NSUserDefaults in Objective-C using the Objective-C runtime. This greatly simplified the string-based API of NSUserDefaults to make it much more convenient and safe to use. Having now primarily switched over to using Swift for iOS projects, I wanted to take a look at how to go about improving UserDefaults in the same way. In Swift, properties do not have setters and getters generated for them, and the dynamic keyword is used for Key-Value Observing. That means we can’t provide method implementations at run-time that effectively set and get values from UserDefaults when a property is accessed. However, KVO can be used to achieve the same effect. The init method is initialized with the instance of our custom user defaults object, and then proceeds to get a list of properties on that class using the Objective-C runtime. We then iterate through the properties and retrieve the name and attribute string of each property to determine the key-path and the type. The key-path is used as the key for storing the value in UserDefaults. Here is an example of an attribute string for an Int property: “Tq,N,VanInteger”. The second character (in this case ‘q’) maps to a type encoding (documented here) that tells us the type of the property. The addObserver method of NSObject takes a context parameter that will be used to store the type of the property so that the proper set method of UserDefaults can be called, so the next task is to switch on the property type and set the context parameter accordingly. UserDefaults has additional getter methods for retrieving certain types of object like Strings, Arrays, URLs, etc., so for object types we do some additional logic to determine the exact type of the object before looking for it in UserDefaults. I won’t go over that here, but it is included in the full source code at the end of the post. The last thing to be done is to define the FSUserDefaults class that we inherit from. The only thing it will do is initialize an instance of FSDefaultsObserver. @objc dynamic var aString: String? Finally, here is the full source code for FSUserDefaults & FSDefaultsObserver, in which character literals are replaced with enums, as well as some other code-cleanup. This entry was posted in iOS, Programming and tagged Apple, defaults, iOS, KVO, NSUserDefaults, Swift, UserDefaults on March 25, 2018 by Chris. In its simplest case, MyUserDefaults would just be a wrapper around NSUserDefaults, but as we see below, this only adds to the amount of boilerplate we have to manage for each new default property that is added. Just add the property to the interface and declare it as @dynamic in the implementation. That’s it! So how is this going to work? First of all, methods in Objective-C are really just C functions with two hidden parameters: self and _cmd, where self is the object on which the method was invoked, and _cmd is the selector. A selector in Objective-C is just a way to identify a method, but we can get some very useful information about a property just from its selector. Before we get to that, however, we need to have a look at what @dynamic is. Declaring a property as @dynamic tells the Objective-C compiler that its implementation methods (the setter & getter) will be resolved at runtime. Normally the compiler generates these for you, as well as synthesizing the instance variable that backs the property. e.g. // Unless you override either the setter or getter, these are normally auto-generated by the compiler. However, with the @dynamic directive, no implementation methods for the property exist at first, which would typically cause an exception to be raised if the property is accessed in any way. Before this happens though, the Objective-C runtime gives you an opportunity to either handle the missing implementation or forward the message invocation to another object. To handle it on the receiving object, we overwrite +(BOOL)resolveInstanceMethod:(SEL)sel inherited from NSObject, and as stated above, we can get all the information we need from the given selector argument of this method. Furthermore, to dynamically add a method implementation to a class, we use the function class_addMethod(Class, SEL, IMP, const char*). We already have the first two arguments to the function (the class is just our FSUserDefaults base class). IMP is a function pointer to the method implementation we are providing, and the character string is the type encoding of the method (its return type and arguments). This is the information we need going forward. Let’s use the userName property as an example. When we access this property by trying to set a value on it for the first time, +resolveInstanceMethod: will be called and the selector argument will be -setUserName:. We can get the name of the selector as a string from the Objective-C runtime function sel_getName(SEL), which takes a selector as its argument. In this case, it will be “setUserName:”, and we can get the property name by stripping off “set” from the beginning and making the ‘U’ lowercase (if instead the selector is a getter, its string is already equal to the property name). The property name string can then be used to retrieve the actual property from the class using the function class_getProperty(Class, const char*). propertyName = ...; // Strip off "set" and make first character lowercase. Given the property, we can now get its attributes as a string by calling property_getAttributes(objc_property_t). This formatted string contains all the information relating to the property, including its type, the class name (if type is an object type), and attributes such as readonly, copy, etc. The two we are interested in are the type and in one special case, the class name. The formatted attribute string always begins with a ‘T’, followed immediately by a character code that indicates its type corresponding to what @encode returns when given a type. e.g. ‘i’ is int, ‘f’ is float, ‘I’ is unsigned int, etc. With this information we can determine which method implementation (IMP) is needed for the given selector as well as the type encoding for the class_addMethod function. const char *propertyName = ...; // Get property name from sel_getName(_cmd), stripping away "set" and making first character lowercase. A function similar to that above is required for each type we need to handle, but fortunately NSUserDefaults has only 6 types we need to deal with: id (objects), NSURL (special case), BOOL, NSInteger, float, and double. NSUserDefaults handles NSURL objects differently than a normal id type, so this is where we need the class name from the properties attributes string. Immediately following the type encoding character (which is ‘@’ in the case of an object) is the class name. We simply check to see if this is equal to “NSURL”, and if it is, select the corresponding IMP function for NSURL instead of the generic id variant. const char *propertyName = ...; // Get property name from sel_getName(_cmd). In the final version of the FSUserDefaults class, I have used a lot of C macro magic to avoid having to duplicate the above setter and getter functions for each supported type, but it is given here in its simpler form for readability purposes. (The Github link to the project can be found below). Finally, we need the type encoding string to pass to class_addMethod that indicates what the signature of the IMP function we are adding is. Since the first two arguments are always id and SEL, this string has the format “r@:a” where ‘r’ is the return type and ‘a’ is the argument type (the second and third character must always be ‘@’ and ‘:’). The type encoding string that corresponds to our example is then “v@:@”, where v indicates a void return type. We can now complete the implementation of +resolveInstanceMethod: by calling class_addMethod and returning YES to tell the runtime system we have dynamically added the method for this selector. This class can then be dropped into any new iOS or macOS app for a much cleaner way of using NSUserDefaults. I created this class a couple of years ago, and have used it in almost every app since. There are many other, powerful and effective ways to use the Objective-C runtime. Reflection in general is great for metaprogramming, building tools, debugging, and generic serialization. This project is available on Github here. This entry was posted in App, iOS, Programming and tagged Apple, iOS, macOS, metaprogramming, NSUserDefaults, objc, Objective-C, reflection, runtime on March 12, 2017 by Chris. Wow, it’s been awhile since I last posted on here! I am still doing a little bit of audio programming, but only as part of the audio system for a game/game engine I’m building from scratch. Aside from that, I’ve been doing a lot of iOS programming as part of my day job, and that got me thinking that I should diversify my blog and talk about anything programming-related that I find interesting and/or valuable. So, on to the topic at hand. When developing an iOS app, before too long you will run into the issue of how to deliver messages or events to other parts of your app. These may include any touch events, actions, completions (e.g. as a result of async operations), or other messages, and there are several ways in which to handle these, each with their own pros/cons depending on context. Perhaps the most well-known is the delegate, which is used extensively throughout UIKit for everything from UITableViews and UICollectionViews to UITextFields and UIPickerViews. Blocks are another option that can replace delegates in some cases, and typically allow you to initialize and define behaviour all in one place without the disjointness of delegates. Yet another tool at our disposal are notifications, which are handled by NSNotificationCenter on iOS (and macOS). This is a broadcast system that delivers messages to any part of your app that may be listening. However, notifications do require some resource management as observers need to be removed once they are no longer interested in being notified (or during shutdown/deactivation). This makes them a little heavy-handed for simple message passing. I’ll also briefly mention two final options for the sake of completion (though there may be others that I’m forgetting at the moment). The target-selector action used by UIControls adds the target-selector pair to a list that the control invokes when a certain event occurs. And finally NSInvocations encapsulate the message-sending mechanism of Objective-C/Swift into an object that can be passed around and invoked by different parts of your app. So, why UIResponder, and how does it fit into this? The UIResponder class forms the foundation of handling events in UIKit, and implements methods that respond to touch events, motion events, etc. Most importantly for our case though, is its nextResponder property. UIKit manages what is called the responder chain for all objects that inherit from UIResponder and that are currently visible or active in the app. This includes views, buttons, view controllers, the window, and even the application itself. A more detailed look at the responder chain and how each object establishes its next responder connection can be seen here, but to put it simply, responder objects “walk up” the responder chain via the nextResponder property until the event is handled or there are no responders left in the chain. This behaviour can be leveraged for sending messages between responder objects using categories on UIResponder. As an example, let’s return to the custom table view referenced above because this is something I implemented recently in an app I am working on. Instead of using a delegate to notify an object that a row has been selected, this table view uses a category on UIResponder. // Determine which, if any, row has been selected. // Call super if needed. i.e. if an ancestor also wants to know about this event. This strategy is also great for when table view cells need to send messages. For example, if a cell has 1 or more buttons, you can invoke the UIResponder category method in the button’s selector to pass the event up the responder chain, which will pass through the table view, it’s superview if one exists, and on to the view controller where you can handle the event. I find this to be a nice alternative to delegates or notifications when it may be somewhat cumbersome to pass instances around and when you don’t want to have to think about subscribing & unsubscribing observers for notifications. It offers similar flexibility that delegates have in that you can define the method signatures however you want with the added benefit of being able to notify more than one responder very easily. As a final example, I used this in a custom popover bubble view to notify other views and view controllers when the popover was dismissed by the user, following a similar pattern to the –viewWillDisappear:, –viewDidDisappear: pair of methods that exist on UIViewControllers. For the custom popover, I have two category methods on UIResponder called –fs_popoverWillDismiss: and –fs_popoverDidDismiss: that are handled in the view controller that presented the popover, updating the UI with some fade animations and re-enabling some controls. For such a simple, lightweight view this is a nice, concise way for it to pass along its events. This entry was posted in iOS, Programming and tagged iOS, UIKit, UIResponder on February 4, 2017 by Chris. Over the past couple of years, I’ve built up a nice library of DSP code, including effects, oscillators, and utilities. One thing that always bothered me however, is how to test this code in an efficient and reliable way. The two main methods I have used in the past have their pros and cons, but ultimately didn’t satisfy me. One is to process an effect or generate a source into a wave file that I can open with an audio editor so I can listen to the result and examine the output. This method is okay, but it is tedious and doesn’t allow for real-time adjustment of parameters or any sort of instant feedback. For effects like filters, I can also generate a text file containing the frequency/phase response data that I can view in a plotting application. This is useful in some ways, but this is audio — I want to hear it! Lately I’ve gotten to know Pure Data a little more, so I thought about using it for interactive testing of my DSP modules. On its own, Pure Data does not interact with code of course, but that’s where libpd comes in. This is a great library that wraps up much of Pure Data’s functionality so that you can use it right from your own code (it works with C, C++, Objective-C, Java, and others). Here is how I integrated it with my own code to set up a nice flexible testing framework; and this is just one application of using libpd and Pure Data together — the possiblities go far beyond this! First we start with the Pure Data patches. 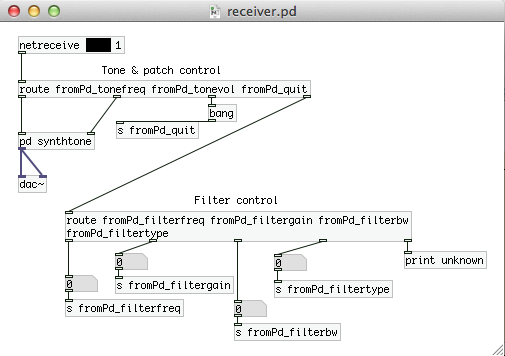 The receiver patch is opened and maintained in code by libpd, and has two responsiblities: 1) generate a test tone that the effect is applied to, and 2) receive messages from the control patch and dispatch them to C++. Receiver patch, opened by libpd. The control patch is opened in Pure Data and acts as the interactive patch. It has controls for setting the frequency and volume of the synthesizer tone that acts as the source, as well as controls for the filter effect that is being tested. Control patch, opened in Pure Data, and serves as the interactive UI for testing. As can be seen from the patches above, they communicate to each other via the netsend/netreceive objects by opening a port on the local machine. Since I’m only sending simple data to the receiver patch, I opted to use UDP over TCP as the network protocol. (Disclaimer: my knowledge of network programming is akin to asking “what is a for loop”). Hopefully the purpose of these two patches is clear, so we can now move on to seeing how libpd brings it all together in code. It is worth noting that libpd does not output audio to the hardware, it only processes the data. Pure Data, for example, commonly uses Portaudio to send the audio data to the sound card, but I will be using Core Audio instead. Additionally, I’m using the C++ wrapper from libpd. 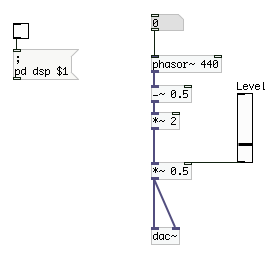 An instance of PdBase is first created with the desired intput/output channels and sample rate, and a struct contains data that will need to be held on to that will become clear further on. pd.init(0, 2, 48000); // No input needed for tests. Next, we ask Core Audio for an output Audio Unit that we can use to send audio data to the sound card. The next part needs some explanation, because we need to consider how the Pure Data patch interacts with Core Audio’s render callback function that we will provide. This function will be called continuously on a high priority thread with a certain number of frames that we need to fill with audio data. Pure Data, by default, processes 64 samples per channel per block. It’s unlikely that these two numbers (the number of frames that Core Audio wants and the number of frames processed by Pure Data) will always agree. For example, in my initial tests, Core Audio specified its maximum block size to be 512 frames, but it actually asked for 470 & 471 (alternating) when it ran. Rather than trying to force the two to match block sizes, I use a ring buffer as a medium between the two — that is, read sample data from the opened Pure Data patch into the ring buffer, and then read from the ring buffer into the buffers provided by Core Audio. Fortunately, Core Audio can be queried for the maximum number of frames it will ask for, so this will determine the number of samples we read from the Pure Data patch. We can read a multiple of Pure Data’s 64-sample block by specifying a value for “ticks” in libpd, and this value will just be equal to the maximum frames from Core Audio divided by Pure Data’s block size. The actual number of samples read/processed will of course be multiplied by the number of channels (2 in this case for stereo). The final point on this is to handle the case where the actual number of frames processed in a block is less than the maximum. Obviously it would only take a few blocks for the ring buffer’s write pointer to catch up with the read pointer and cause horrible audio artifacts. To account for this, I make the ring buffer twice as long as the number of samples required per block to give it some breathing room, and also keep track of the number of frames in reserve currently in the ring buffer at the end of each block. When this number exceeds the number of frames being processed in a block, no processing from the patch occurs, giving the ring buffer a chance to empty out its backlog of frames. testData.pdSamplesPerBlock = (pd.blockSize() * 2) * testData.pdTicks; // 2 channels for stereo output. testData.ringBuffer.resize(testData.pdSamplesPerBlock * 2); // Twice as long as needed in order to give it some buffer room. With the output Audio Unit and Core Audio now set up, let’s look at the render callback function. It reads the audio data from the Pure Data patch if needed into the ring buffer, which in turn fills the buffer list provided by Core Audio. The buffer list is then passed on to the callback that processes the effect being tested. // Don't require input, but libpd requires valid array. // Only read from Pd patch if the sample excess is less than the number of frames being processed. // write pointer from catching up to the read pointer. // NOTE: Audio data from Pd patch is interleaved, whereas Core Audio buffers are non-interleaved. Finally, let’s see the callback function that processes the filter. It’s about as simple as it gets — it just processes the filter effect being tested on the audio signal that came from Pure Data. Not quite done yet, though, since we need to subscribe the open libpd instance of Pure Data to the messages we want to receive from the control patch. The messages received will then be dispatched inside the C++ code to handle appropriate behavior. Pure Data & libpd Interactive Demo from Christian on Vimeo. This entry was posted in Audio, Programming and tagged Audio Units, Core Audio, DSP, filter, libpd, Pure Data, testing on December 7, 2014 by Chris. I have recently gotten back into Pure Data in the interest of familiarizing myself more with it, and perhaps to integrate it with Unity for a future project. For anyone who may not be familiar with it, more info on it can be found here. It’s a great environment for building synthesizers and experiment with a great variety of audio processing techniques in a modular, graphically-based way. Oscillators are the foundation of synthesizers of course, and Pure Data comes with two modules that serve this purpose: osc~ for sine waves, and phasor~ for a sawtooth (it’s actually just a rectified ramp in the range 0 – 1, so it needs a couple of minor additions to turn it into a sawtooth wave). However, the phasor~ module (not being band-limited) suffers from aliasing noise. This can be avoided either by passing it through an anti-aliasing filter, or by using the sinesum message to construct a sawtooth wave according to the Fourier Theorem of summing together sine waves (i.e. creating a wavetable). Both of these methods have some drawbacks though. Sawtooth wave using Pure Data’s phasor~ module. 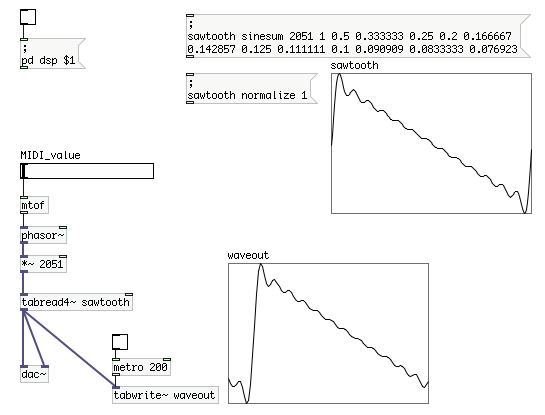 Constructing a sawtooth from a wavetable of 12 harmonics (source: http://en.flossmanuals.net/pure-data/). A robust anti-aliasing filter is often computationally expensive, whereas wavetables sacrifice the quality of the waveform and are not truly band-limited across its entire range (unless the wavetable is divided into sections constructed with decreasing number of harmonics as the frequency increases). A wavetable sawtooth typically lacks richness and depth due to the lack of harmonics in its lower range. These issues can be fixed by constructing the sawtooth using band-limited steps (BLEPs), which are based on band-limited impulse trains (BLITs), at the expense of some increased complexity in the algorithm. And fortunately, Pure Data allows for custom modules to be built, written in C, that can then be used in any patches just like a normal module. The equation for the PolyBLEP is based on the discussion of the topic on this KVR forum thread. The concensus in the thread is that the PolyBLEP is far superior to using wavetables, but sounds slightly duller than using minBLEPs (which are far more complicated still, and require precalculation of the BLEP using FFT before integrating with the naive waveform). PolyBLEP oscillators strike a good balance between high quality, minimal aliasing noise, and reasonable complexity. 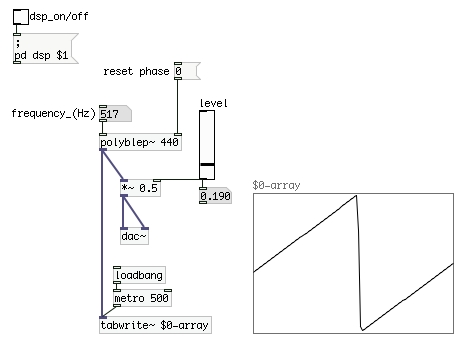 Pure Data patch using the polyblep~ module for a sawtooth wave. Here is a quick sample of the PolyBLEP sawtooth recorded from Pure Data. Of course, PolyBLEPs can be used with other waveforms as well, including triangle and square waves, but the sawtooth is a popular choice for synths due to it’s rich sound. The GitHub page can be found here, with projects for Mac (Xcode 5) and Windows (Visual Studio 2010). This entry was posted in Audio, Programming and tagged BLIT, C, external, KVR, library, oscillator, PolyBLEP, Pure Data, sawtooth on September 3, 2014 by Chris.